Chicken Rice Soup, classic winter soup, Thyme for Cooking healthy gourmet. If you can get cheap chicken wings, add them to the stock for more flavor. I used Basmati but any rice will be delicious. You can make it even more simple using just chopped, boneless chicken breasts and canned broth. The cornstarch doesn't thicken the soup so much as add a more luscious 'mouth-feel'. Cut the vegetables into large chunks. If you are using celery tops, use them all, including the leaves. 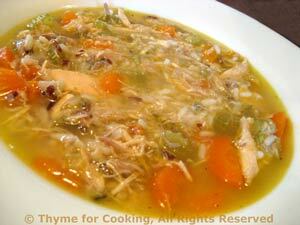 Put chicken, vegetables, herbs and water in soup pot or Dutch oven. Cover, bring to a boil, reduce heat and simmer for an hour if using parts, 2 or 3 hours if using a whole chicken. When done, strain stock, discarding vegetables and reserving chicken. If time allows, chill stock and remove fat. Refrigerate chicken if not making soup immediately. Bring stock to a boil over medium heat. Cut carrots in half, the long way then thinly slice. Add to stock. Thinly slice celery, add to stock. Clean leek, slice thinly, including 3 inches of green, add to stock. Add herbs, mustard, cover, reduce heat and simmer 20 minutes. Add rice, simmer 20 minutes. Dissolve cornstarch in water, stir into soup. Cut the chicken into small pieces, discarding skin and bones. Add to soup and heat through.